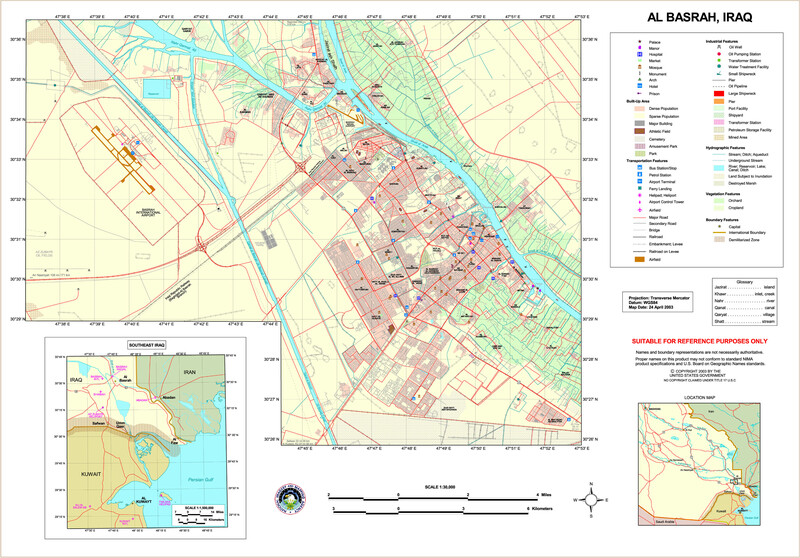 Basra (also known as Başrah or Basara; historically sometimes called Busra, Busrah, and early on Bassorah; Template:Lang-ar, Al-Basrah) is the second largest city of Iraq with an estimated population of about 1,377,000 in 2003. It is the country's main port. The city is located along the Shatt al-Arab (Arvandrood) waterway near the Persian Gulf. Basra is 55 km from the Persian Gulf and 545 km from Baghdad. Basra is the capital of the Basra province. The area surrounding Basra has substantial petroleum resources with many oil wells. The city also has an international airport. Basra is in a fertile agricultural region, with major products including rice, maize corn, barley, millet, wheat, dates, and livestock. The city's oil refinery has a production capacity of about 140,000 barrels a day (22,300 m�). The city was founded in 636 as an encampment and garrison for the Arab tribesmen constituting the armies of Caliph Umar ibn al-Khattab, a few miles south of the present city, where a tell still marks its site. While defeating the Sassanid forces there, the muslim commander Utba ibn Qazwan first set up camp there on the site of an old Persian settlement called Vaheštābād Ardašīr, which was destroyed by the invading Arabs. (according to Encyclop�dia Iranica, E. Yarshater, Columbia University, p851). The name Al-Basrah, which in Arabic means "the over watching" or "the seeing everything", was given to it because of its role as a Military base against the Sassanid empire. Other sources however say its name originates from the Persian word Bas-rāh or Bassorāh meaning "where many ways come together". (See Mohammadi Malayeri, M. Dil-i Iranshahr). Under the name of Bassorah it is mentioned in the Thousand and One Nights, and Sindbad the Sailor was said to have begun his voyages here. It was long a flourishing commercial and cultural center, until it was captured by the Ottoman Empire in 1668, after which it declined in importance, but was fought over by Turks and Persians and was the scene of repeated attempts at resistance. In 1911, the Encyclopaedia Britannica reported some Jews and a few Christians living in Basra, but no Turks other than Ottoman officials. The wealthiest and most influential personage in Basra was the nakib, or marshal of the nobility (i.e. descendants of the family of the prophet, who are entitled to wear the green turban). In 1884 the Ottomans responded to local pressure from the Shi'ites of the south by detaching the southern districts of the Baghdad vilayet and creating a new vilayet of Basra. Among the Muslims of the area were the remains of the Sabaeans or Mandaeans, whose headquarters were in the area formerly called Suk esh-Sheikh. A network of canals flowed through the city, giving it the nickname "The Venice of the Middle East" at least at high tide. The tides at Basra fall by about 9 feet (2.7 m). For long, Basra grew the finest dates in the world. During World War I the occupying British modernized the port (works designed by Sir George Buchanan), which became the principal port of Iraq. During World War II it was an important port through which flowed much of the equipment and supplies sent to Russia by the other allies. At the end of the second world war the population was some 93,000 people. The University of Al Basrah was founded in 1964. By 1977 the population had risen to a peak population of some 1.5 million. The population declined during the Iran-Iraq War, being under 900,000 in the late 1980s, possibly reaching a low point of just over 400,000 during the worst of the war. The city was repeatedly shelled by Iran and was the site of many fierce battles, but never fell. After the first Persian Gulf War in 1991 Basra was the site of widespread revolt against Saddam Hussein, which was violently put down with much death and destruction inflicted on the city; a second revolt in 1999 led to mass executions in and around Basra, subsequently the Iraqi government deliberately neglected the city and much commerce was diverted to Umm Qasr. In March through May of 2003, the outskirts of Basra were the scene of heavy fighting in the 2003 invasion of Iraq. British forces, led by units of 7th Armoured Brigade, took the city on 6 April 2003. On 21 April 2004, a series of bomb blasts ripped through the city, killing scores of people. This city was the first stop for the United States and the United Kingdom, during the 2003 Invasion of Iraq. The Multi-National Division (South East), under British Command, is currently engaged in Security and Stabilization missions in Basra Province and surrounding areas. Basra is also the name of a fishing-type card game played in coffeehouses throughout the Middle East. This page was last modified 12:05, 19 Jun 2005. This page has been accessed 11532 times.